My husband and I were extremely fortunate to find the perfect daycare in just one day of searching. The genuine love and attention for our daughter was obvious and, with the staff treating us more like extended members of their family than paying “customers,” we knew she was in good hands each morning we dropped her off. Unfortunately, we didn’t realize just how lucky we were until we moved. When we had to start the process over again, we ended up testing out three different schools before finding one that could even compare to what we were used to. And it’s not that we were simply being picky; how would you react if you showed up early and caught the teacher push your child to the ground and scream that Santa Claus wasn’t coming this year? That’s why this issue, in which we present our 2013 Best Preschools & Daycares on the Family side, is so important. The amount of trust we place in early education providers every day shouldn’t be underestimated. If we can’t be home with our children, then we can’t have any doubts they’re in a loving, safe environment where they’re building the best foundation possible. (Luckily, we have found that school again, and our daughter is back to looking forward to going every day.) But I do wish we had a list at the time like the one you’ll find on Page 18 (flip the book); it would have made the search a lot easier. 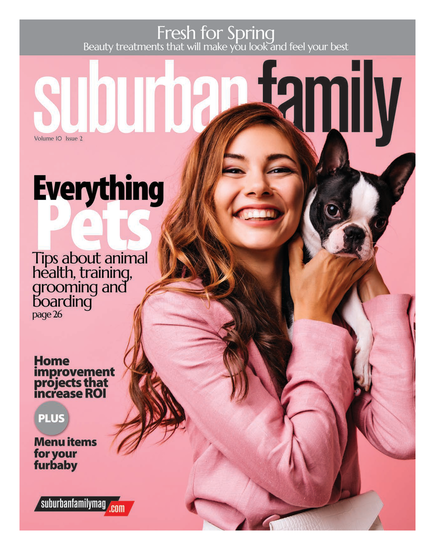 In addition, this issue is packed with health information for your family, such as an article on the benefits of orthodontics care—in honor of National Children’s Dental Health Month—and on heart attack and stroke prevention—in recognition of American Heart Month. And again on the Family side, you’ll also take a look back with us at the best coaches of the past 12 months in our Coaches of the Year feature. I must say, when you find yourself wondering where your daughter is during her soccer game, only to find her rolling around on the sidelines in a pile of soccer balls, you understand the challenge these men and women face. For that, we thank them. Published (and copyrighted) in Suburban Family Magazine, Volume 3, Issue 12 (February, 2013).